The Unigine Debugger allows you to inspect your UnigineScript code at run-time. For example, it can help you to determine when a function is called and with which values. Furthermore, you can locate bugs or logic problems in your scripts by executing them step by step. 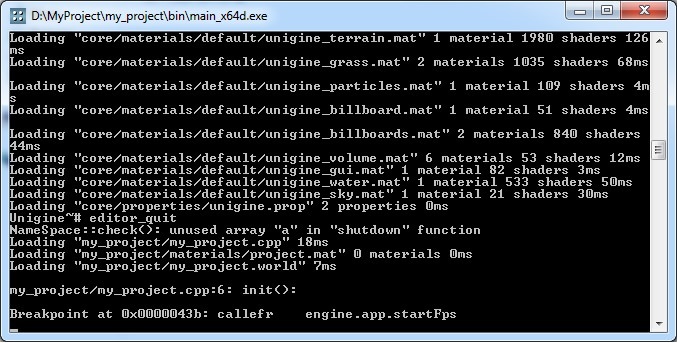 An additional information from the scripting system of Unigine is obtained if you use debug builds. The engine may cause the errors of two types: compile-time and run-time. A source code string with an invalid statement. An error description from the interpreter. Recursive includes are not tracked, so be careful with file inclusions and use defines when in doubt. In user class definitions make sure that all member variables are declared before they are used in a constructor or a method. Interpreter::parse(): unknown "Foo" class member "a"
The point is that due to a dynamic typing the interpreter does not know what will be returned by object.doSomething(), maybe, even nothing, and that may lead to a run-time error. Current stack of function calls. An assembly dump of an invalid statement. You can debug run-time errors with a console debugger. NULL objects. Please, don't forget to initialize declared objects and check the values returned from functions. Stack underflow (or overflow) when less (or more) arguments than required are provided to a function. When creating a vector, make sure you provide a correct capacity (non-negative). If the negative capacity is specified, a vector size is set to 0 by default. Also, when addressing vector contents, make sure an index being used exists; the same is true for maps and their keys. Also, a map key cannot be NULL. Make sure you use correct swizzles with proper objects. For example, you cannot use swizzles with scalar types. Make sure that if you use wait control structure in the class method, this class method is called as a static one. Use class_cast() with caution. Remember that it converts an instance of one user class to another without warnings, even if those classes have nothing in common. Lots of transient objects. This is not exactly an error, but if you create in a short period plenty of user class objects that soon become unused, the performance will drop every 32 frames because of garbage collector clean-ups, until all unused objects are gone. In this case, the performance drop will be caused by both a multitude of objects and expensive object destruction. To run the debug process, you can insert the breakpoint; instruction in your code or set the run-time breakpoint. Note that the debugger opens in the main (external) console, which is available only in the debug builds. To invoke the console debugger, insert a breakpoint; instruction in the script you are working on. This type of instructions used for the precise breakpoints placing. You can insert more than one breakpoint; instruction in your script. When a breakpoint is encountered, the engine execution stops, and the application stops responding to user actions. Instead, the external console starts receiving user input. In this console, you can step through instructions using the next command. Also it is possible to set the breakpoint during the debug process by using the break command. It is useful, for example, when you debug a loop. Or you can run the other debugger commands, if necessary. If the console is unavailable, as in Windows release builds, this will seem as a hang-up of the engine. To avoid that, use a "breakpoint" macro defined in the file data/core/unigine.h. This macro also correctly preserves FPS values. There is also a way to set a run-time per-function interpreter breakpoints with the specified number of arguments via the editor console. A required script instruction is triggered for breakpoint, so the engine execution stops and the external console starts to receive the user input. Moreover, it is also possible to set the breakpoint flag inside the debugger. There are 3 types of such breakpoints: system_breakpoint, world_breakpoint and editor_breakpoint, used for system, world and editor scripts respectively. This type of breakpoints does not require the script recompilation. The syntax to set the breakpoint is the following: system_breakpoint/world_breakpoint/editor_breakpoint set/remove function_name number_of_arguments. When the breakpoint is encountered, the console debugger is invoked, and you can run debugger commands. The last parameter number_of_arguments is optional. The debugger also supports limited autocompletion and history of commands. Retrieve map values by arbitrary keys. Only int, float,and string keys are supported. The debugger supports several console commands listed below. Continues interpreter execution until the next breakpoint or the end of the script is reached. Here N is an optional argument specifying the number of breakpoints to skip. By default, N equals to 0. Executes the next instruction. This command is used to step through instructions starting from the breakpoint. Here N is an optional argument specifying the number of instructions to skip. By default, N equals to 0. Dumps the function call stack. Function calls are listed starting from a C++ function call, which is not included in the stack. For example, if some script function is invoked as a callback, you will not see the invoking C++ function. If a function address is intact, a function name will be displayed, otherwise, you will see gibberish instead of the name. The address changes, if there are yield or wait instructions in the function body. Disassembles a certain number of instructions starting from the current instruction. Here N is an optional argument specifying the number of instructions to process. By default, N equals to 8. 0x0000046c: pushc	string: "Iteration: %d\n"
0x00000472: pushc	string: "Value: %d\n"
Displays contents of given variables. Here var_list is a list of space-separated variable names. If a variable is not local to the current scope, its name should contain a namespace prefix. This command is useful, when you want to check, for example, which instruction changes variable values. Displays all variables in the current scope. Crashes interpreter. Useful when the enigne itself is run in a debugger (for example, gdb), as it allows seeing the stack of C++ function calls. Toggles the current breakpoint. You can add or remove the breakpoint for each script instruction during the debug process. By using this command, you cannot remove the breakpoint (breakpoint; instruction) you set in the script. Here is a list of assembly mnemonics for the assembly dump.